Latest information for leaders from CTC's main website is available here. For insurance purposes leaders should have contact details for all riders. A list of frequent riders is here so you only need to add any other names. Log in details from marilynspurr@hotmail.com. If you want to lead a ride, speak to a committee member so they can register you. Then you will be covered by CTC insurance (www.ctc.org.uk). Work out a route that your group is likely to enjoy, taking into account the aim of the ride, facilities, terrain, seasons, daylight, weather and temperature, likely abilities, and, on the ride, progress. Be prepared to vary your route if prudent. Decide how you will navigate the ride (GPS, maps, local knowledge). If you don't have detailed route knowledge already, riding the route in advance can be useful to get local knowledge and timings for cafe and lunch stops. It’s good to use cycle tracks and facilities where provided, but their use is not a legal requirement. Some are tricky for groups to use. Use them if you consider it safe for the group. Don't use pedestrian footways. 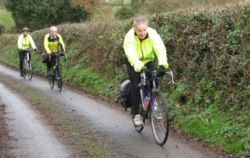 Outline key features of the ride and any obvious hazards that the route might contain. This is important because new or novice riders may not yet have the skills or stamina to complete the planned route safely. Whilst not directly responsible for a person’s safety on a CTC ride, the leader ensures, as far as possible, the safe conduct of the group. If any rider is intending to ride a bike which is obviously defective, then the safety implications might need to be pointed out, as there could also be a safety issue for the whole group. Use the ‘Guest Entry’ form for new or non-CTC riders, which then allows the appropriate cover by CTC insurance to apply, noting that minors need parental agreement (separate form). Introduce new riders to others in the group. Consider nominating a ‘Back-Marker’ whose job it is to see that slower riders, or those who encounter mechanical problems, have sufficient support to stay with the group. In 'extremis', the ‘Back-Marker’ may accompany someone with a problem along a shorter route, or stay with them until the problem is resolved. Leader and back-marker would normally exchange mobile phone numbers. Set and adjust the pace to the needs of the group. Riders should let the leader lead, and those who pass the leader, in effect, leave the group. At all times check and be able to account for everyone in the group – riders should never leave without letting the leader know. If you are leading a large group of, say, 8 or more riders, it may be appropriate to split the group down into sub-groups of no more than 6, with adequate space between each sub-group to allow an overtaking vehicle to 'leap-frog' along the entire group when road conditions are safe to do so. Be aware that you and your group have a right to be on the road. But you have a duty of care to other road users, as they do to you. Manage your group to allow vehicles to pass safely, but if this is not possible, other road users have no right to expect your group to leave the road in order for them to pass. Make your judgement on the safety of your group, though, not primarily the convenience of other road users. Where the group has to stop to allow slower riders to catch up, ensure the group stops in a safe location and does not impede other road users, or their sight-lines at junctions. Try to ensure the group conforms to the guidance in the Highway Code. It's not essential but try and get someone to take the occasional photograph as these make any write-up so much more interesting to others. The website always needs new photographs, to inspire others to join our activities. Don't forget to try and complete a short light-hearted write-up of your ride, and submit it to the editor of 'The Highwayman' so that it can be included in the magazine. E-mail is fine to tom.dunn@blueyonder.co.uk. Details of witnesses, contacts, registration numbers, and key details are recorded. There is an incident form which will need to be completed for serious incidents and returned to CTC for insurance and other purposes. ICE Contact List (password protected) - contains names of regular riders and details of who they would like to be contacted in case of an emergency. This list is useful to register riders present at the start of a ride. New or 'Guest Rider' form for adults - (Word) (PDF) - for adults. New or guest rider form for children - (PDF). Incident Report Form - only the front page is required for minor collisions. The back page is for more serious accidents / hospital visits. Send completed forms to the CTC Devon Secretary. Note that CTC membership is now wholly web-based - CTC Membership Application Page. If you are missing any of the documents please contact your local secretary for replacements, or copy them from the links above. This page was last edited on 18 August 2018, at 10:06.